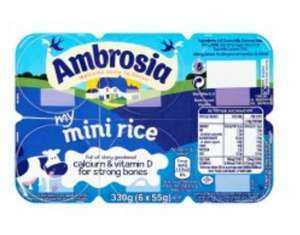 Saw Ambrosia my mini rice pack of 6 for £1 (normally £1.60) in Tesco instore. The offer doesn't seem to be online. It's important to have a varied and balanced diet as part of a healthy lifestyle. Calcium and Vitamin D are needed for normal growth and development of bones in children.